The advent of internet or online journalism has evidently improved the speed and spread of modern practice of the fourth estate of the realm. In- fact, arguments have been put forward that any credible print media that runs a website can no longer be referred to as local newspaper/magazine, irrespective of its financial strength or inability to publish hardcopy that has National and regional circulation. Research has even shown that the most read newspapers online in Nigeria and other parts of the world, don't even publish the convention hardcopy. The growth of internet journalism has greatly boost the development and practice of journalism, apart from creating jobs for thousands of practitioners, who hitherto may have found it difficult to secure conventional employment. In as much as internet journalism has taken the practice of Mass Communication to greater heights, it has created pitfalls that need to be immediately addressed, in order to restore the dignity as well as professionalism of the noble pen and paper profession. Online Journalism has unfortunately encouraged plagiarism and given birth to quacks, who masquerades as bloggers and content providers. Classical case of the encouragement of plagiarism is the concept of "buy one, read all", a situation where most of our national dailies publish almost same banner headlines with different bye-lines. The use of stories from online portals by privately owned local Radio/TV Stations without crediting same to the original media owners, coupled with its attendant effect of not giving employment opportunities to potential correspondents, are among demerits of the advent of internet journalism. 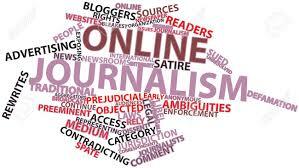 From the foregoing, it has become urgent for NUJ, Nigeria Press Council, Media Proprietors and other critical professional stakeholders to work towards restoring the dignity and ethics of journalism, by addressing the odd sides of internet journalism. A stitch in time, they say, saves nine.